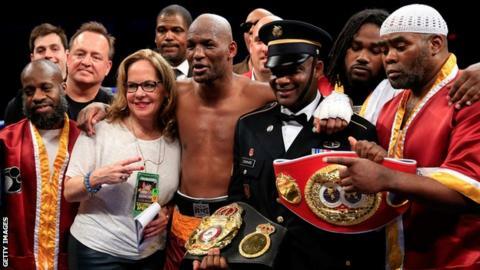 Bernard Hopkins has become the oldest boxer to unify a weight division. The 49-year-old added the WBA light-heavyweight crown to his IBF title with a points victory over Kazakhstan's Beibut Shumenov. A split-decision verdict - two scores of 116-111 in Hopkins' favour against 114-113 for the 30-year-old - did not reflect the American's dominance. On the undercard, Shawn Porter retained his IBF welterweight belt by stopping Paulie Malignaggi in the fourth round. Hopkins, who has not stopped an opponent in nearly a decade, could not finish off Shumenov but continued to defy the years in Washington. He came on strong from the third round onwards and knocked his opponent down with a punishing right in the 11th. Shumenov climbed off the canvas but Hopkins, already the oldest man to win a recognised world title, got the nod from the judges after 12 rounds to take his career record to 55 wins from 65 fights, with six defeats, two draws and two no contests. Earlier in the evening, undefeated American welterweight Porter, 26, retained his IBF belt by beating Malignaggi and could now face Britain's Kell Brook this summer. Porter sent his 33-year-old opponent crashing through the ropes and on to the ring apron midway through the fourth round, prompting the referee to halt the contest. Undefeated Brook, 27, is the mandatory challenger for the IBF belt.